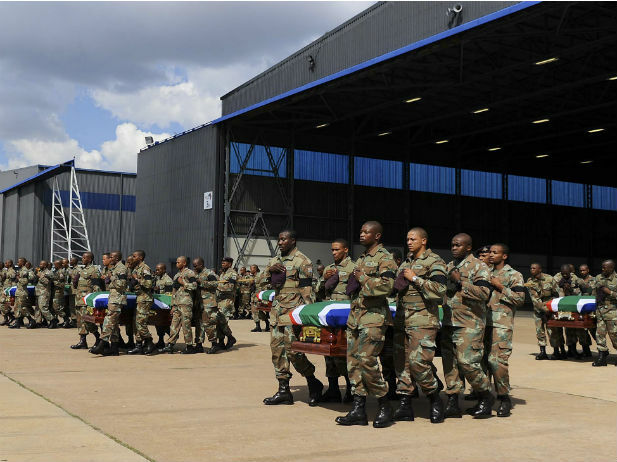 Many people in South Africa were shocked by the death of at least 13 South African National Defence Force (SANDF) troops when rebels overran their base in the capital of the Central African Republic (CAR). Amongst the public and within the media questions soon started arising around the possible reasons why troops were in CAR to begin with. When it emerged that troops were possibly partly deployed to protect businesses in CAR linked to top African National Congress (ANC) officials, there was widespread outrage. The fact that South African troops were involved in protecting the political and economic interests of wealthy people linked to the South African state in CAR, and other African countries, should perhaps, however, not come as a surprise. Throughout its history, whether during apartheid or post apartheid, the South African state – which is controlled by the ruling class and headed up by members of this class – has been most willing to deploy troops in parts of Africa to protect the political, economic and strategic interests of the South African ruling class. Indeed, the ruling class in South Africa have for decades had an explicit agenda of expanding their political and economic interests in Africa; in order to increase their own wealth and power. This has not changed since 1994. It is, therefore, not an accident that current state policies such as the New Growth Path and National Development Plan openly promote the expansion of South African linked businesses and state-owned companies, in terms of trade and investment, into the rest of Africa. It is also not an unfortunate mishap or twist of fate that the South African state at every opportunity seeks to expand its political influence in Africa, including bullying some members of the African Union into accepting a South African as Commission Chairperson. In plain words, the South African ruling class, in the past and present, act as imperialists in the rest of Africa . Like all imperialists, they also at times have to back up their economic and political interests and ambitions with a show of military power. That means at times deploying troops (who are, unfortunately, literally foot-soldiers from the working class) when necessary to protect their companies, their allies and their strategic interests. In this imperialist game, blood has been spilt and people sacrificed in the name of profit and power. As a matter of fact, the deployment of troops to protect their economic and political interests was truly honed by South Africa’s ruling class – in those days made up exclusively of white capitalists and top white state officials – by the 1960s. Consequently, by 1967 the South African state was heavily involved in the War of Independence in Zimbabwe. The reason: to protect South African business interests in the country, including the mining interests of companies such as AngloAmerican, to prop up an ally in the form of the Smith regime, and to role back the prospect of a black nationalist movement taking state power in the then Rhodesia. To do so, military equipment was supplied to Rhodesia’s armed forces and from 1967 onwards up to 4 000 members of the South African Police (SAP) were permanently deployed as combatants in the war – which included guarding the infrastructure of large South African corporations. The South African Security Branch also funded the notoriously brutal Selous Scouts, comprised of “turned” guerrillas and white special forces, and a number of its members also served in the unit. In the process, members of the SAP were involved in killing and torturing thousands of Zimbabweans on behalf of protecting the South African ruling class’s political and economic interests. The role that the South African state played particularly in Angola led to the near destruction of the country. When the Portuguese state left Angola in 1975, the South African state escalated the war. This began with a full-scale invasion by the South African Defence Force in 1975. Such invasions became common and South African troops were involved in decimating the south of the country. Clandestine operations were also conducted in other parts of the country, including sabotaging Angola’s oil fields. Linked to this, between the 1970s until 1990 the South African state actively supported the National Union for the Total Independence of Angola (UNITA) rebel group, which included undertaking joint operations on a large scale. Their aim was, in fact, to have a protracted war that would drain the Angolan state’s resources and to also obliterate any development in the country and thereby snuff out the prospect of it ever developing into a rival. Having UNITA ascending into state power or beating the Cubans, the People’s Movement for the Liberation of Angola (MPLA), the South West Africa People’s Organisation (SWAPO) and the ANC as is popularly believed, therefore, were not the primary aims; these would for the apartheid state planners have been bonuses, but they were not the central goal. The horrific story of almost totally destroying a country’s infrastructure also played itself out in Mozambqiue. When Portuguese troops withdrew from Mozambique so too did those from the SAP. Along with this, many South African companies lost their business interests in Mozambique when they were taken over by the state and new emerging Mozambican ruling class (although some like AngloAmerican struck a deal and avoided this). Plans were, however, soon hatched by the South African and Rhodesian states to set up a surrogate force, Mozambique National Resistance Movement (RENAMO), to destroy Mozambique’s infrastructure. Specifically, the South African state wanted to destroy Mozambique’s ports, pipelines, roads and railways to ensure that it did not become a viable alternative to South Africa, with regards to importing and exporting goods, for other southern African countries. This desire to destroy the country’s transport system went as far as using South African special forces to blow up bridges, pipelines and marker bouys in and connected to the Beira harbour. The result was that large parts of Mozambique were crippled and hundreds of thousands of people died as battles raged between the RENAMO and the state’s forces. Again through spilling blood, South Africa’s ruling class got what they wanted – a country in tatters. Throughout the 1980s other neighbouring countries like Lesotho and Zimbabwe also faced incursions by South African troops, agents and special forces. To keep Zimbabwe dependent on South Africa, infrastructure – including the British based company, Lonrho’s, oil pipeline – were blown up by South African special forces. Likewise, to avert any threat to South Africa’s military dominance in southern Africa, weapons and equipment at a number of Zimbabwe army bases and 13 jet fighters at the Thornhill Air Base were blown up by South African agents in the early 1980s. The reality is that the make-up of the ruling class in South Africa’s has changed since the dark days of the wars in Angola and Mozambique. Certainly, white capitalists remain a large part of the ruling class in South Africa; their ill-gotten gains being firmly protected by the ANC-led state. They have, however, now been joined in the ruling class by a small black elite, centred around the state, the ANC and/or black economic empowerment. Sometimes there has been tension between these two racially-based sections of the ruling class. However, what they have been united in has been their exploitation of the working class in South Africa and their exploitation and abuse of the rest of Africa. Indeed, the continuity in the South African ruling class’s dominance of southern Africa from apartheid to the post-apartheid period has been striking. The South African state and South African-linked companies have become one of the largest sources of foreign direct investment in the rest of Africa since 1994. When needed, the South African state after 1994, like its predecessor during apartheid, has not been shy to send the military into areas in Africa where South Africa’s allies have been threatened or where its own direct interests have been undermined. Old and new faces in the ruling class, when needed, have therefore been just as ruthless towards other parts of Africa as the ruling class had been during apartheid. By 2000, South African troops were even being deployed further north into Africa, beyond the South African ruling class’s traditional power base of southern Africa. Thus, by the turn of the century SANDF troops were in the Democratic Republic of the Congo (DRC) as a ‘peace-keeping’ force. By then, private and state-owned South African companies were making inroads into the country. As time has gone by this presence has grown exponentially. Relations between the South African and DRC state have also become closer. For the South African ruling class this has brought benefits. The DRC state has awarded the Oppenheimers (the South African family that owns the corporate giant AngloAmerican) and Motsepe (an ANC linked capitalist who owns African Rainbow Minerals) mining rights, it has given Zuma’s nephew oil concessions, and it made the South African state owned ESKOM the central player in a massive hydroelectric project. It is perhaps no co-incidence that the number of South African troops in the DRC has also grown as South African interests in the country have expanded. By 2012 the number of South African troops in the DRC had reached almost 1 300 troops; with as many as another 1 500 to be deployed in 2013. While this has been done under the auspices of United Nation’s (UN) ‘peace keeping’, the deployment of troops is also about the South African state projecting power, enhancing its political credibility and protecting its ‘generous’ ally, the DRC state. As part of this too, the South African state has become an important arms supplier – through its nationalised arms company, Denel – to the DRC state. The gradual movement of South Africa’s influence up the continent has also seen it deploying troops in South Sudan. The South Sudanese state is a very close ally of the South African state and ruling class. It has granted South African private and state-owned companies concessions in the telecommunications, agricultural, forestry, water purification, financial, infrastructure development, energy, oil and minerals sectors. Partly in return, the South African state pushed for an independent South Sudanese state; it supplied it with weapons and it trained the South Sudanese military. South African troops are also directly deployed and their explicit role is to ensure the security of South Sudan militarily. A similar situation existed in the CAR. By the mid-2000s South Africa’s ruling class and the CAR state were moving closer. Specifically, the Bozize regime at the time was looking to break the stranglehold that French imperialism had over it, and it approached the South African state and ruling class as an alternative. As part of this, investment opportunities, including in the oil industry, were opened up for South African-linked companies. Key people linked to the ANC such as Billy Masetlha, Joshua Nxumalo and Paul Langa, along with the ANC’s business wing, Chancellor House, reportedly have used such opportunities to acquire business interests in the CAR. In return a deal was signed in 2006, whereby South Africa would offer military assistance to the Bozize regime. This included training CAR troops and later involved South Africa deploying its own troops and even providing security directly to Bozize. The disturbing reality is that South Africa has been playing an imperialist game in Africa for years. Like all imperialist powers, the South African ruling class needs and wants a strong state to back up their economic expansion. As the anarchist-communist Alexander Berkman pointed out, and as seen in the actions of South Africa’s elite in the rest of Africa, ruling classes of imperialist states “compel some weaker nation to give them special privileges…. and then call upon their respective governments to defend their interests…then the governments call upon their people to ‘defend their country’” . Indeed, the ruling class in South Africa, because of their power, has been given privileges and riches across Africa. The South African state has protected these through political maneuvering, and when this has failed or when it has not been enough it has used nationalist rhetoric to get working class soldiers to defend these privileges, often by protecting allied local regimes. The working class, especially those in the military, need to realise, therefore, that they are being used as pawns by the South African ruling class. They are being used as the foot soldiers to defend and further the riches and power of the South African ruling class in Africa. What is needed, therefore, is for working class people in the military to abandon this role and belief in SANDF propaganda that they are doing good; when in reality they are being used to further the power and profits of the South African elite. This won’t happen overnight and will probably require widespread and very militant struggles based on a revolutionary consciousness, beyond even what we have seen so far, to perhaps influence and thereby fundamentally alter the outlook of working class members of the military. The struggles that are once again beginning to emerge in South Africa, like those on the mines and farms, do have the real potential to develop into such a militant revolutionary movement – but this will take time, it may go through a long period of ebbs and flows, and it will require building a revolutionary consciousness. However, these struggles do also have a duty when it comes to South African imperialism. These struggles need to begin to take an internationalist perspective, especially when it comes to Africa. The reason being: the same ruling class that is exploiting the working class on the mines and farms locally is the same ruling class exploiting workers and the poor in the rest of Africa, including in the CAR. The working class involved in these struggles on the farms, mines and communities, therefore, need to take the South African ruling class to task as part of their struggle not only for what this elite class has done locally, but also in the rest of Africa. The working class in other African countries too, can’t try and rely on the local ruling classes in these states to defend them from imperialism, including South African imperialism. Although sometimes the elite in some African countries are annoyed by imperialist powers, like South Africa, they don’t fully challenge them. As matter of fact, the ruling classes across Africa, as was so evident in the CAR, ally with one imperialist power or another because they benefit from it – it increases their own wealth and power. Thus, they have no material interest in fully ending all forms of imperialism. Even if, however, local ruling classes were to fully challenge the South African elite or any other imperialist, it would not mean an end to the oppression of workers and the poor in Africa. The ruling classes in southern Africa owe their positions to exploiting and dominating their own ‘citizens’ – this is the only way they can keep their positions at the top of these societies. Thus, workers and the poor can’t rely on local ruling classes or states – which are hierarchical, centralising pillars of minority rule – to bring about freedom. The ruling classes won’t give people freedom – if they did they would lose their power and privileged positions, which history tells us they are not willing to do. Therefore, trying to form cross-class alliances are a dead end. For workers and the poor, the local elite are as much of an enemy as the imperialist elite. In fact, workers across the world have more in common with one another than they do with any boss, general or politician. Workers and the poor across Africa and internationally, therefore, need begin to forge unity in struggle against their common enemies: imperialist and local ruling elites. As part of this, the working class needs to further build its own counter-power and organisations based on direct democracy. This will be a long process, also involving fighting for reforms to build towards revolution, but it is vital if genuine justice is to be achieved in South Africa, the rest of Africa and indeed the world. Only the popular classes (workers, the unemployed and small-scale peasants), through their own organisations, can achieve the power to one day fight to end the world of states, capitalism, imperialism and all forms of oppression. Indeed, only the popular classes themselves can eventually create a new world based on genuine communism, worker self-management and organs of direct democracy and self-governance, like federated worker and community assemblies and councils. Only in this world will imperialist politics and wars, and the greed and jingoism they are based on, be fully ended. This includes the imperialist endeavours the South African state undertakes too, like its actions in CAR and the DRC. Berkman, A. 2003. What is Anarchist-Communism. AK Press, pp. 37. Next ›I-ANC ikhumula isifihla buso sayo! Kubulewe abasebenzi!